The Warrior Project Ostasize capsules contain the ultimate anabolic blend of ostarine and epicatechin for unrivalled lean gains. You'll benefit from both the muscle building and muscle preserving effects of ostarine and epicatechin combined to carve a larger, leaner physique with minimal natural testosterone suppression. Ostarine is a non-steroidal Selective Androgen Receptor Modulator (SARM) meaning that it specifically targets your skeletal muscle and bone cells to prevent protein breakdown and promote growth without the risk of the side effects usually associated with steroid use. When you're dieting down your body lacks the energy and hormone stimulation it needs to repair and rebuild your muscle fibres - if you're not careful you'll find yourself in a catabolic state. Supplementing with SARMS whilst keeping on top of your nutrition means you won't have to worry about sacrificing your hard-earned gains when you're trying to shred fat. The Warrior Project Ostasize is also safe to take between cycles of other performance enhancing supplements with a far lower risk of toxicity and damage to your muscle, tendons and ligaments. 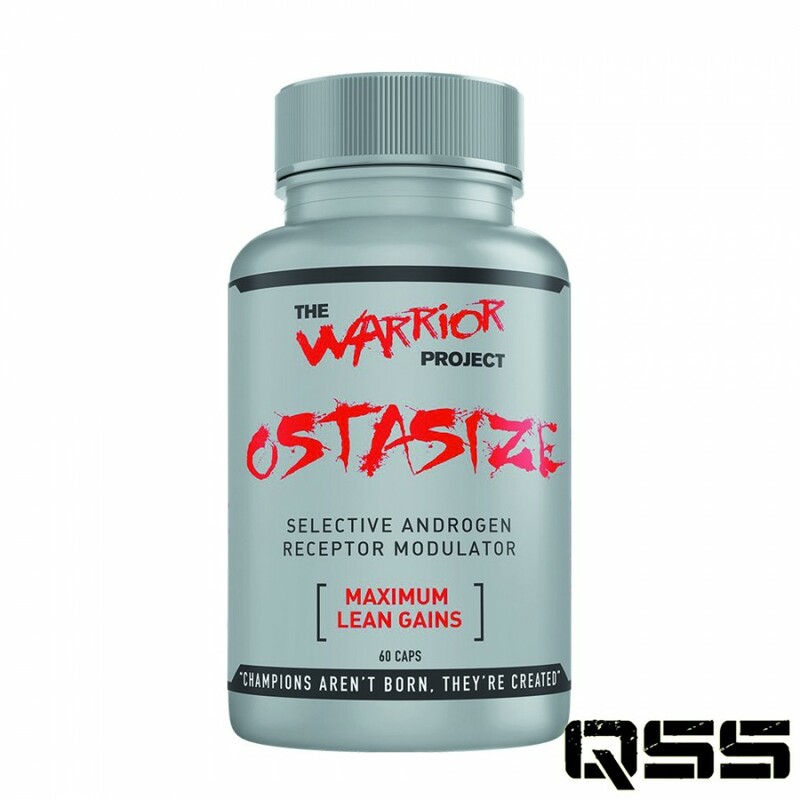 If you're serious about gaining serious size then The Warrior Project Ostasize is the SARM for you. Each bottle of The Warrior Project Ostasize contains 60 capsules, enough to supply a 4-week cycle on the maximum recommended dose. Who is Warrior Project Ostasize SARM For? The Warrior Project Ostasize capsules are the ultimate anabolic aid suitable for both healthy male and female athletes working to achieve a larger, leaner physique than could be built by training or nutrition alone – whether you're shredding down, bulking up or need a bridge between cycles of other performance enhancing supplements Ostasize is the one you want. The Warrior Project Ostasize capsules are not suitable for children or adults under the age of 21. For those with any pre-existing medical condition or currently on prescribed medication, please seek the advice of a medical professional before starting supplementation. Do not use The Warrior Project Ostasize if you are a competitive athlete subject to testing for performance enhancing substances. Please note that The Warrior Project Ostasize capsules contain gelatin. When to Use Warrior Project Ostasize SARM? The Warrior Project Ostasize capsules are best taken as a single dose: Take 1 to 2 capsules first thing in the morning or 3 hours before training to supplement a balanced diet and consistent training plan. Do not exceed the maximum recommended dose. Exceeding the recommended dose does NOT mean more rapid results so stick to the science and keep putting in the hard work. Do not take for longer than 4 weeks continuously without taking an 8 week "off" period. Capsule Shell (Gelatine), Anti-Caking Agents (Magnesium Stearate, Silicon Dioxide, Stearic Acid). Ostasize is best taken as a single dose, either 1-2 caps upon waking or 1-2 caps 3 hours prior to training. Ostasize can be stacked with any other Warrior Project product. Do not exceed recommended amount or take longer than 4 continuous weeks without an 8 week off period.